How Well Do Top Games Retain Users? 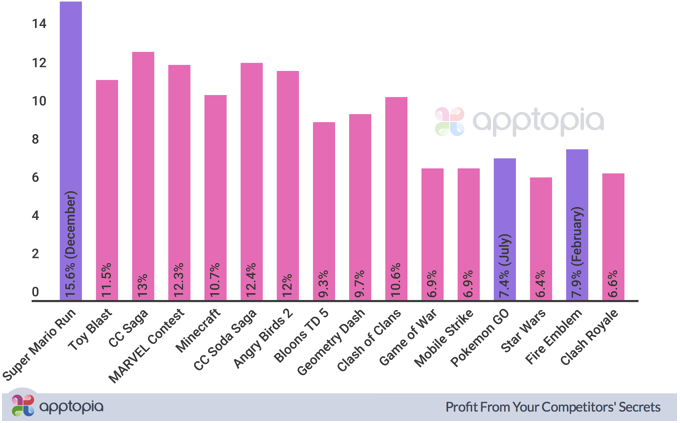 - Top grossing games do not experience the high retention that top ranked overall apps do. - Toy Blast experienced the most YOY growth (28.7%) of the games we analyzed. - Clash Royale is full of whales. It has the lowest current 14th day retention rate (5.7%) of the games we analyzed but is one of the greatest grossing games on the market. How do I read retention and what am I looking at? When someone downloads your app, this is day zero. We assume on download day that the user also opens the app. Retention on day zero is always 100%. But do they open the app the next day? This is day one. What about the day after that? How about a week later? Two weeks later? 30 days later? This is what retention percentage tells us. Keep in mind that if I download Battle Bay on Monday and you download it on Wednesday, my day one will be Tuesday whereas yours will be Thursday. Toy Blast has the highest current 14th day retention rate of all the games we analyzed that have been on the market for at least one calendar year. 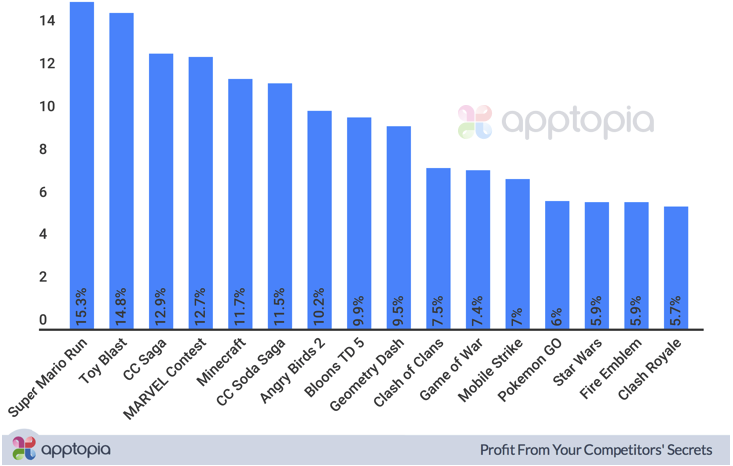 If we take away that qualifier, Super Mario Run (iOS only) retains an impressive 15.3% of players after two weeks. You will see in the first chart that top ranked apps (think Facebook, Snapchat, YouTube, Pandora, etc.) do very well retaining their users after initial download. *All data is based on Apptopia Intelligence. The data below is the average (iOS + Android) 14th day retention for April in the United States. We’ve also broken out the April 2016 retention data for a year-over-year comparison. You will notice three apps bars of a differing color (Super Mario Run (iOS only), Pokemon GO, Fire Emblem). This is due to the app not being live for one year and we have therefore taken the retention since launch. 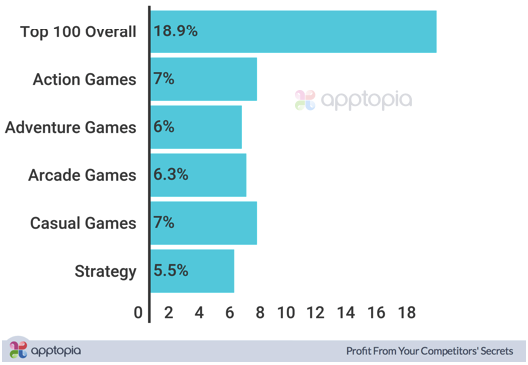 All games included are currently at or above their respective category average but below the average 14th day retention of the top 100 apps overall. 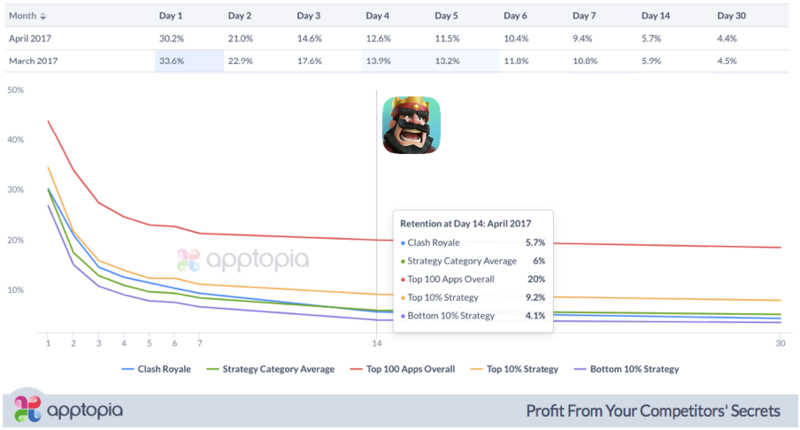 Here's a closer look at Clash Royale for Android: 30 Day Retention data for apps can be broken out by store, country and month. If you would like to acquire more data or receive any data point on any app or SDK, please contact us or schedule a demo.